Soooo, using your "logic," I must conclude that the ancient pagans didn't worship idols, or have images. After all, if their most famous examples don't exist, why should I believe they ever existed? Not really. All you guys have ever done for years now is say the above. "We're right, its clear!" as if that really meant something. I don't know what happened during the years of my absence from this forum, but from my total time here, I don't know if this is an entirely fair assessment. Many different people seem to have offered answers to this and similar questions from different angles to try and present a comprehensive answer (I myself learned some new things from this discussion). But the only answer that seems like it would satisfy the questioner is something outrageous along the lines of "Here is a photo of an icon from the first century, along with a treatise written by the Apostle Silas describing the apostolic theology of icons and how to venerate them...you'll notice the same procedure outlined in the Jordanville Prayer Book nineteen centuries later". Absent this, his attitude seems to be that icons are just plain old idolatry. All manner of Youtube videos making outrageous claims with flimsy evidence are acceptable when they fit his narrative, but the moment something doesn't, the only way to prove it is to pull a first century example out of your hat. Nonsense. I have to concur with your diagnosis on our physician who cannot heal himself. Par for the course 'round these parts. I say icons were not part of the earliest church at all, as I have never been able to find a record or writing of them from early on. I've searched so many early writings.. Nothing. How do you define "earliest church?" Your likely answer, combined with the implied assumption that the "earliest church" is the criterion of faith, would cause problems as even if one were to grant that icons weren't part of the "earliest church," other things like the completed New Testament itself wouldn't be part of the "earliest church." Since hey, no writings saying these 27 works are the dogmatic compilation of post-OT Scripture are found from time of the apostles. Right? I mostly focus on 1st and 2nd century Christianity. Too bad you live in the 21st century. I think the first known example of Christian icon-veneration is when the apostles bowed down before Christ (Matthew 28:9), the icon of God the Father (Colossians 1:15). 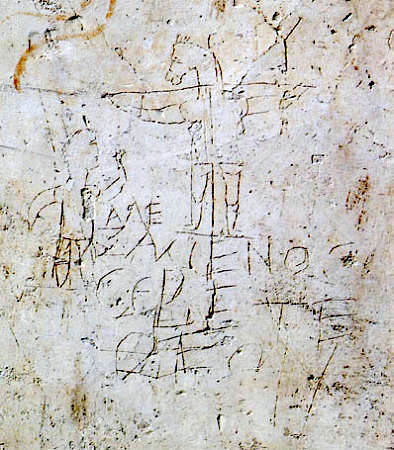 There's also the Alexamenos graffito, which is a satire of a Christian venerating a cross (which has the same theological justification as venerating an icon). I don't know if jesusisiamism accepts independent evidence as proof. (btw, at the LATEST, this grafitto dates two centuries after the Crucifixion, and might just be one century after, or even less). When was the idea of Christ introduced and can it be proven? I don't want legends from the so-called gospels or later additions to Josephus or made-up tradition. DNA evidence is preferable. If you have videotapes of any of his miracles, that would help me out too. I also accept live-streaming of any of his sermons. Also, it might help me out if we could get Jesus' thoughts on calling His mom the Theotokos, anybody have any recordings on that? I'm usually all for mocking as a way to get a point across, but in this case it seems like he has serious questions and really wants to be able to be Orthodox. There is nothing wrong asking for reasonable evidence to back the claim that icon painting comes directly from Christ and the apostles. I would claim no such thing. But maybe I'm wrong in that. If it needs to be proven as true and we have enough historical evidence to verify other practices, it seems reasonable to be able to provide some evidence for this. I think that the framework is there for imagery in worship settings in the temple and at early Christian gathering sites, but he seems to want evidence of people bowing before and kissing images in the early centuries. I personally don't think anyone's gonna find it because I don't think anyone was doing it. The problem with jesusisiam's conscience is that he credits it and its "knowledge" more than the wisdom and fidelity of the Church. Ever since Lucifer's tumble down to Satan, Pride hath come before a fall. Wow. Never saw this before. The Classics department at one University I was at had a collection of a lot of graffiti from antiquity. Nothing much different than you would find scrawled on a men's bathroom stall. God ordered we venerate His image in ourselves when He ordered chastisty. God ordered the construction of images of Heaven in the Temple and on the Ark, made His own Presence there, and ordered that His Presence should be venerated there. God shows the difference between God-oriented veneration and idolatry in the case of healing serpent of bronze of Moses. God orders veneration of the serpent for the healing of the people, God destroys the image when it turns into idolatry. So you have images that were rightfully venerated in the Temple, images that were worshipped (the Golden Calf) and a pedagogical example where one turns into the other, so we would be able to differentiate, neither denying the first, nor falling into the second. Revelations is filled with liturgical imagery and it's an entirely visual book. Although divinely inspired, in its form it's clearly the product of a religious environment that is primarily visual and liturgical. Further, in visions and dreams Gods makes His presence and will known through speech *and* icons. Although most certainly the ways of veneration have changed over the centuries, it was always a God-inspired tradition. A general assumption that Early Christianity was generally aniconic, opposed to religious imagery in both theory and practice, has been challenged by Paul Corby Finney's analysis of Early Christian writing and material remains (1994). This distinguishes three different sources of attitudes affecting Early Christians on the issue: "first that humans could have a direct vision of God; second that they could not; and, third, that although humans could see God they were best advised not to look, and were strictly forbidden to represent what they had seen". These derived respectively from Greek and Near Eastern pagan religions, from Ancient Greek philosophy, and from the Jewish tradition and the Old Testament. Of the three, Finney concludes that "overall, Israel's aversion to sacred images influenced early Christianity considerably less than the Greek philosophical tradition of invisible deity apophatically defined", so placing less emphasis on the Jewish background of most of the first Christians than most traditional accounts. Finney suggests that "the reasons for the non-appearance of Christian art before 200 have nothing to do with principled aversion to art, with other-worldliness, or with anti-materialism. The truth is simple and mundane: Christians lacked land and capital. Art requires both. As soon as they began to acquire land and capital, Christians began to experiment with their own distinctive forms of art". His third source of attitudes faces the problem that as synagogues predating 313 have been unearthed, they have had iconography, including the one down the street from the Dura Europas Church. What i wanted to say was just that the thing that helped me in my journey towards iconography was looking on the truth matter, not history matter. Iconography was coined publicly as the church got so thanks to Constantine, but the understanding was there before, even long way back to the ark of the covenant. Back in the early church a priest/monk could worship and love God much more just by watching the waves of the sea. If was need icons today, and the church can declare and prove it truthful, then history does not matter. Forgive me if i point out some examples or questions. But the bible and its content/message can´t withstand the test we many times put forth on iconography. The texts and its entirety was kept through tradition, or else someone need to give me a new testament written 10 years after Christs death for me to believe it. No rather the truth within it is what matters, not where I can find the earliest copy. Same standard goes with it all, including icons. If the EO worship in 100 years only would consist of prayer, 24 hours a day, among 100% of EO believers. What would the one seeking for 100% praying Christians say when he/she couldn´t find that through history. Is praying 24 hours a day then wrong? That inlays another problem for another thread. Constantine.... Yes, St. Constantine - murdered over 200k people AFTER Nicea. Go check other threads. And you keep killing that poor dead horse. How can you expect to be a saint? Hey if a man who kills 200k people after his conversion to Christianity can be venerated on put on an iconostasis....... Oh nevermind. 200.000? I find that hard to believe. don't let facts get in the way of the narrative. Like the fact that St. Constantine could have been dumped after his death by his generation, like Stalin rightly was. 200,000, btw, would be about 5% of the population. Stalin at most killed 10%, perhaps as low as 5%. No, iconodules were murdered by iconoclasts. Read history, not revisionism. And certainly I accept the 1st and 2nd Century stuff. Why else do I ask for it so much? Odd thing is, and the harsh reality, there were no icons used by the earliest Christians, or writings about icons. Nothing of the sort exists in early Christian writings.... Gah, and to think, this man worshiped on the Sabbath AND practiced the Jewish feasts..... He's a saint too, but by EO canon, anathema.... Irony at its best.... You really can't make this stuff up. Then did you make this thread for any other reason than to argue? In the earliest Christian Church, as you put it, what need would there to be icons? The death of Christ was still recent, and many of the disciples still knew Him firsthand, so why write icons of someone that way in your midst(as a living breathing person, ignoring everything else). Why are you so infatuated with first and second century Christianity? The Scriptures say that the Church is the pillar and foundation of all truth. If the Orthodox Church is the Church in historical and spiritual continuity with the Apostles then this matter lies within her authority. She exercised that authority at the 7th Council to consider all these matters…the same authority used by the Church in Acts 15 to settle the questions surrounding the teachings of the Judaizers. At the 7th council the boundaries with which images could be made and used within the Church were established, and various misuses discouraged and condemned. The only essential question here is not what did the first century Church do…but rather what did the Church do with respect to the question of images. The Church, like her Head is not bound in Time, but is rather bound together by the Spirit across all ages both past and yet to come. The Church, in the Spirit made a decision on this question. One accepts it or rejects it…but if you reject it, then wittingly or not you reject Christ as well as His Bride in to whose hands He committed this question. If you protest the Council was not a Council of the Church then where did the "true" Church disappear to for several centuries. Did it go invisible all of a sudden after nearly a 1000 years of being historical and visible? Where is this Church today? Can it still speak with the same authority as did the Church of the 7 councils? If you admit the 7th Council was a Council of the Church, then you cannot escape the authority of that council and its canons upon the faith for all Christians of every age. The Church has spoken on this issue. The matter was resolved and peace restored to the Church after 150 years of turmoil and persecution. There is no appeal to a first or second century Church. The Church is one. It has one life just like there is but one life in ontological continuity between a seed and the cornstalk. The stalk may resemble the seed outwardly very little if at all…but inwardly it is the same…the same life, the same DNA unfolding and growing, and reproducing according to it's kind. So…does the Orthodox Church reproduce in kind with the Apostolic Church? Does it still produce holy lives of transfigured men and women from that day till this of Apostolic character? So, unless we suddenly have been bereft of Holy Elders and Living Saints in this age, then it is self evident the Orthodox Church still reproduces in kind, and thus show it is the Church in ontological continuity with the Apostles. That Church has spoken. And according to the Apocalypse the Spirt and Bride speak as one. The matter is settled. Your choice is only to accept and honor that authority or deny and dishonor it and thus the one Who gave that authority. I see no other reasonable option. he worships a god of the gaps, thinking he can fill them in. We proclaim Christ also by our senses on all sides, and we sanctify the noblest sense, which is that of sight. The image is a memorial, just what words are to a listening ear. What a book is to the literate, that an image is to the illiterate. The image speaks to the sight as words to the ear; it brings us understanding. Hence God ordered the ark to be made of imperishable wood, and to be gilded outside and in, and the tablets to be put in it, and the staff and the golden urn containing the manna, for a remembrance of the past and a type of the future. Who can say these were not images and far-sounding heralds? And they did not hang on the walls of the tabernacle; but in sight of all the people who looked towards them, they were brought forward for the worship and adoration of God, who made use of them. It is evident that they were not worshipped for themselves, but that the people were led through them to remember past signs, and to worship the God of wonders.They were images to serve as recollections, not divine, but leading to divine things by divine power. And God ordered twelve stones to be taken out of the Jordan, and specified why. For he says: "When your son asks you the meaning of these stones, tell him how the water left the Jordan by the divine command, and how the ark was saved and the whole people." (Jos. 4.21-22) How, then, shall we not record on image the saving pains and wonders of Christ our Lord, so that when my child asks me, "What is this?" I may say, that God the Word became man, and that for His sake not Israel alone passed through the Jordan, but all the human race gained their original happiness. Through Him human nature rose from the lowest depths of the earth higher than the skies, and in His Person sat down on the throne His Father had prepared for Him. From In Defense of the Holy Images. Indeed, there's nothing St John of Damascus can't answer. It is evident to all that flesh is matter, and that it is created. I reverence and honour matter, and worship that which has brought about my salvation. I  honour it, not as God, but as a channel of divine strength and grace. Was not the thrice blessed wood of the Cross matter? and the sacred and holy mountain of Calvary? Was not the holy sepulchre matter, the life-giving stone the source of our resurrection? Was not the book of the Gospels matter, and the holy table which gives us the bread of life? Are not gold and silver matter, of which crosses, and holy pictures, and chalices are made? And above all, is not the Lord's Body and Blood composed of matter? Either reject the honor and worship of all these things, or conform to ecclesiastical tradition, sanctifying the worship of images in the name of God and of God's friends, and so obeying the grace of the Divine Spirit. Why do you color the citation blue? It sorta makes its hard on the eyes to read. For those who care the simplest solution is cut and paste of course. A veritable blitzkrieg of masterful argument! That is what I find most annoying... the people that want change are never happy to change themselves and allow others to remain the same, they insist on forcing it on everyone else. I guess it is the only way they feel legitimate. The Faith was created by God, and people have no right or ability to change it, we must accept it as it is. The other alternative is it has been created by people, and we have the right to change it. The problem here is that if the Faith is created according to the form of people's desires, it has no authority, there is no reason to accept it because it is not the truth - it is based on their own desires and not truth (ahem... Jeremiah 17:9). Hey easy there, fella! Don't forget that "Faith" is about finding the things you like from each religion and customizing it to suit your own individualistic taste(s). Just jumble it all together! It's basically a postmodernists wet-dream. In that respect, it's perfectly reasonable to assume that the things you don't like about Orthodoxy, never really happened at all! After all, if something really happened, there would be well documented evidence to support it. This is especially true for the first century Church, which had plenty of time and resources to leave a detailed, secure record of all their practices and the meaning behind them. If they wanted us to venerate icons, they wouldn't have left it to mere Tradition, right? Oh yeah, and the Church has no authority to introduce other forms of worship that were not around in the first two centuries. Nice to see you trolling around for stuff to troll and you spent three hours on it. They're your words ialmisry's quoting, Jason. Or are you denying you said them? A more serious but necessary challenge could be. Prove me that there was even a church existing in the 1th century. "I´m a historian, so your religious, traditional and fairy tale bible is not proof". I want more than that. Yet we instantly accept as christians the fact that the church existed in the 1th century, not because the historian say yes or no on the matter. But because Christ promised it and he is the truth. I thought the Bible as any written manuscript from the 1st century / 2nd century qualifies as a certified historical artefact of that time. I keep doing it, an NOBODY has EVER shown me an icon from the 1st century of the church. Period. Nor are there any writings of it on the 1st century of the church. Can you point to a surviving manuscript from the New Testament from the first century? I don't think any manuscripts have survived from that period either. I heard the same, that the original manuscripts of the New Testament did not survive. We don't have any original manuscripts of the Bible today. Just copies of copies. I'm not denying I said them. Its just funny (sad) he trawled through 1044 posts to re-post a bunch of things in different threads in response to me making him mad and some weird vendetta that seems to be developing. He wouldn't have needed to trawl through your every post. All he would have needed to do is a search on a keyword or phrase he knows you've used, and do a search, specifying your user name in the search. After the death and resurrection of Christ the new faith spread rapidly throughout the Roman world and the Near East. The stories of the Apostles and early witnesses who had seen and known Christ Himself were eagerly listened to by the converts to the new faith. Naturally, people who had seen Christ asked for descriptions of His appearance. At some point people began to create and distribute paintings of Christ. This also included his disciples and the reall martyrs of the Christian faith. The earliest images we know of was a statue of Christ which Eusebius, an important early Christian bishop, says had been set up in Caesarea-Phillipi (Paneaus) by the woman healed by Christ of an issue of blood. He also notes that in his time there were very ancient images of Peter and Paul. However, the church was somewhat divided about images of Christ. Eusebius refused to send the wife of Caesar Callus an image of Christ, for he thought it is idolatrous and a violation of Biblical injunctions. Some regional churches were against images as well, a local Spanish synod in 305 said images in churches were forbidden. However, the number of examples of paintings of the nativity and allegories of the Good Shepherd from around 250 AD, show how common Christian paintings had already become. The growth of images was concurrent with the development of the doctrine of the Incarnation of Christ and is closely tied to the growing awareness of this essential element of the Christian faith. The earliest surviving Christian art comes from the late 2nd to early 4th centuries on the walls of tombs belonging, most likely, to wealthy Christians in the catacombs of Rome, although from literary evidence there may well have been panel icons which, like almost all classical painting, have disappeared. Initially Jesus was represented indirectly by pictogram symbols such as the Ichthys (fish), the peacock, or an anchor (the Labarum or Chi-Rho was a later development). Later personified symbols were used, including Jonah, whose three days in the belly of the whale pre-figured the interval between Christ's death and Resurrection; Daniel in the lion's den; or Orpheus charming the animals. The Tomb of the Julii has a famous but unique mosaic of Christ as Sol Invictus, a sun-god. The image of "The Good Shepherd", a beardless youth in pastoral scenes collecting sheep, was the most common of these images, and was probably not understood as a portrait of the historical Jesus at this period. It continues the classical Kriophoros, and in some cases may also represent the Shepherd of Hermas, a popular Christian literary work of the 2nd century. Among the earliest depictions clearly intended to directly represent Jesus himself are many showing him as a baby, usually held by his mother, especially in the Adoration of the Magi, seen as the first theophany, or display of the incarnate Christ to the world at large. The oldest known portrait of Jesus, found in Syria and dated to about 235, shows him as a beardless young man of authoritative and dignified bearing. He is depicted dressed in the style of a young philosopher, with close-cropped hair and wearing a tunic and pallium – signs of good breeding in Greco-Roman society. From this, it is evident that some early Christians paid no heed to the historical context of Jesus being a Jew and visualised him solely in terms of their own social context, as a quasi-heroic figure, without supernatural attributes such as a halo (a fourth-century innovation). There are also representations of the young people of Babylonia rescued from the flames of the furnace, Susan saved from the snares of the elders, Noah who escaped the flood, and Daniel who stayed unharmed in the lions’ den. From the New Testament, the miracles are chosen of healing (the blind man, the paralytic, the hemorrhaging woman) and resurrection (Lazarus, the widow of Naim’s son, Jairus’ daughter), but also other episodes, such as the conversation with the Samaritan woman at the well and the multiplication of the loaves. The art of the catacombs is also a symbolic art in the sense that some concepts which are difficult to express are represented in a simple way. To indicate Christ a fish is depicted; to signify the peace of heaven a dove is represented; to express firmness of faith an anchor is drawn. On the closing slabs of the loculi, symbols with different meanings are often engraved. In some cases, a tool is depicted which indicates the dead person’s trade in life. Some symbols, such as glasses, loaves of bread and amphorae, allude to the funeral meals consumed in honor of the deceased, the so-called refrigeria. Most of the symbols refer to eternal salvation, such as the dove, the palm, the peacock, the phoenix and the lamb. The catacombs and the Mother of God. In the Roman catacombs the most ancient image is preserved of Our Lady who is depicted in a painting in the cemetery of Priscilla on the Via Salaria. The fresco, which can be dated back to the first half of the third century, depicts the Virgin with the Child on her knees in front of a prophet (perhaps Balaam or Isaiah) who is pointing to a star to refer to the messianic prediction. In the catacombs other episodes with Our Lady are also represented such as the Adoration of the Magi and scenes from the Christmas crib, but it is thought that prior to the Council of Ephesus, all these representations had a Christological and not a Mariological significance. The Good Shepherd in the catacombs. One of the images represented the most in the art of the catacombs is the Good Shepherd. While the model is taken from pagan culture, it immediately takes on a Christological significance inspired by the parable of the lost sheep. Christ is thus represented as a humble shepherd with a lamb on his shoulders as he watches over his little flock that is sometimes made up of only two sheep placed at his sides. The Catacombs of Rome (Italian: Catacombe di Roma) are ancient catacombs, underground burial places under Rome, Italy, of which there are at least forty, some discovered only in recent decades. Though most famous for Christian burials, either in separate catacombs or mixed together, they began in the 2nd century, much as a response to overcrowding and shortage of land. Many scholars have written that catacombs came about to help persecuted Christians to bury their dead secretly. The soft volcanic tuff rock under Rome is highly suitable for tunnelling, as it is softer when first exposed to air, hardening afterwards. Many have kilometres of tunnels, in up to four storeys (or layers). The Christian catacombs are extremely important for the art history of early Christian art, as they contain the great majority of examples from before about 400 AD, in fresco and sculpture. I barely spent five minutes on it. Odd that he should think I waste such time going through 1044 posts with such interest, when he doesn't devote such attention and interest to the Scriptures. It's called research. I half-remember things people write here all the time and then I go looking for it to a) make sure my memory is correct and b) quote it so others can remember it, as well. It's not difficult to do, either. At a guess, because we have so little from that time, that it allows one to claim authenticity and authority for one's own personal interpretations and pet beliefs. So you have (broken) ESP now? Wow. Anyway, the fact that this turned into a veiled ad hominem by dredging up tons of old posts and calling me a 'burn out' just shows no one here can create a rational response. Address the topic, not the person and all that stuff, that everyone else is expected to follow. Venerating icons, having them in churches and homes, is what the Church teaches. They are "open books to remind us of God." Those who lack the time or learning to study theology need only to enter a church to see the mysteries of the Christian religion unfolded before them. Icons are necessary and essential because they protect the full and proper doctrine of the Incarnation. While God cannot be represented in His eternal nature ("...no man has seen God", John 1:18), He can be depicted simply because He "became human and took flesh." Of Him who took a material body, material images can be made. In so taking a material body, God proved that matter can be redeemed. He deified matter, making it spirit-bearing, and so if flesh can be a medium for the Spirit, so can wood or paint, although in a different fashion. The seventh and last Ecumenical Council upheld the iconodules' postion in AD 787. They proclaimed: Icons... are to be kept in churches and honored with the same relative veneration as is shown to other material symbols, such as the 'precious and life-giving Cross' and the Book of the Gospels. The 'doctrine of icons' is tied to the Orthodox teaching that all of God's creation is to be redeemed and glorified, both spiritual and material. First Session (September 24, 787) -- Three bishops, Basilius of Ancyra, Theodore of Myra, and Theodosius of Amorium begged for pardon for the heresy of iconoclasm. Second Session (September 26, 787) -- Papal legates read the letters of Pope Hadrian I asking for agreement with veneration of images, to which question the bishops of the council answered: "We follow, we receive, we admit". Third Session (September 28, 787) -- Other bishops having made their abjuration, were received into the council. Fourth Session (October 1, 787) -- Proof of the lawfulness of the veneration of icons was drawn from Exodus 25:19 sqq. ; Numbers 7:89; Hebrews 9:5 sqq. ; Ezekiel 41:18, and Genesis 31:34, but especially from a series of passages of the Church Fathers; the authority of the latter was decisive. Fifth Session (October 4, 787) -- It was claimed that the iconoclast heresy came originally from Jews, Saracens, and Manicheans. Sixth Session (October 6, 787) -- The definition of the pseudo-Seventh council (754) was read and condemned. Aya Sofya of Nicaea, where the Council took place; Iznik, Turkey. It was determined that "As the sacred and life-giving cross is everywhere set up as a symbol, so also should the images of Jesus Christ, the Virgin Mary, the holy angels, as well as those of the saints and other pious and holy men be embodied in the manufacture of sacred vessels, tapestries, vestments, etc., and exhibited on the walls of churches, in the homes, and in all conspicuous places, by the roadside and everywhere, to be revered by all who might see them. For the more they are contemplated, the more they move to fervent memory of their prototypes. Therefore, it is proper to accord to them a fervent and reverent adoration, not, however, the veritable worship which, according to our faith, belongs to the Divine Being alone — for the honor accorded to the image passes over to its prototype, and whoever adores the image adores in it the reality of what is there represented." Eighth Session (October 23, 787) -- The last session was held in Constantinople at the Magnaura Palace. The Empress Irene and her son were present and they signed the document. The clear distinction between the adoration offered to God, and that accorded to the images may well be looked upon as a result of the iconoclastic reform. However sculpture in the round was condemned as "sensual". The twenty-two canons drawn up in Constantinople also served ecclesiastical reform. Careful maintenance of the ordinances of the earlier councils, knowledge of the scriptures on the part of the clergy, and care for Christian conduct are required, and the desire for a renewal of ecclesiastical life is awakened. The council also decreed that every altar should contain a relic, which remains the case in modern Catholic and Orthodox regulations (Canon VII), and made a number of decrees on clerical discipline, especially for monks when mixing with women. The papal legates voiced their approval of the restoration of the veneration of icons in no uncertain terms, and the patriarch sent a full account of the proceedings of the council to Pope Hadrian I, who had it translated (the translation Anastasius later replaced with a better one). This council is celebrated in the Eastern Orthodox Church, and Eastern Catholic Churches of Byzantine Rite as "The Sunday of the Triumph of Orthodoxy" each year on the first Sunday of Great Lent the fast that leads up to Pascha (Easter) and again on the Sunday closest to October 11 (the Sunday on or after October . The former celebration commemorates the council as the culmination of the Church's battles against heresy, while the latter commemorates the council itself. I believe, therefore, and make my confession in one God, the Father Almighty, and in one Lord Jesus Christ, his only begotten Son, and in the Holy Ghost, the Lord and Giver of Life. The Trinity, one in essence and one in majesty, must be worshipped and glorified in one godhead, power, and authority. I confess all things pertaining to the incarnation of one of the Holy Trinity, our Lord and God, Jesus Christ, as the Saints and the six Ecumenical Synods have handed down. And I reject and anathematize every heretical babbling, as they also have rejected them. I ask for the intercessions (πρεσβείας) of our spotless Lady the Holy Mother of God, and those of the holy and heavenly powers, and those of all the Saints. And receiving their holy and honourable relics with all honour (τιμῆς), I salute and venerate these with honour (τιμητικῶς προσκυνέω), hoping to have a share in their holiness. Likewise also the venerable images (εἰκόνας) of the incarnation of our Lord Jesus Christ, in the humanity he assumed for our salvation; and of our spotless Lady, the holy Mother of God; and of the angels like God; and of the holy Apostles, Prophets, Martyrs, and of all the Saints— the sacred images of all these, I salute and venerate— rejecting and anathematizing with my whole soul and mind the synod which was gathered together out of stubbornness and madness, and which styled itself the Seventh Synod, but which by those who think accurately was called lawfully and canonically a pseudo-synod, as being contrary to all truth and piety, and audaciously and temerariously against the divinely handed down ecclesiastical legislation, yea, even impiously having yelped at and scoffed at the holy and venerable images, and having ordered these to be taken away out of the holy churches of God; over which assembly presided Theodosius with the pseudonym of Ephesius, Sisinnius of Perga, with the surname Pastillas, Basilius of Pisidia, falsely called tricaccabus; with whom the wretched Constantine, the then Patriarch, was led (ἐματαιώθη) astray. Theodosius, the humble Christian, to the holy and Ecumenical Synod: I confess and I agree to (συντίθεμαι) and I receive and I salute and I venerate in the first place the spotless image of our Lord Jesus Christ, our true God, and the holy image of her who bore him without seed, the holy Mother of God, and her help and protection and intercessions each day and night as a sinner to my aid I call for, since she has confidence with Christ our God, as he was born of her. Likewise also I receive and venerate the images of the holy and most laudable Apostles, prophets, and martyrs and the fathers and cultivators of the desert. Not indeed as gods (God forbid!) do I ask all these with my whole heart to pray for me to God, that he may grant me through their intercessions to find mercy at his hands at the day of judgment, for in this I am but showing forth more clearly the affection and love of my soul which I have borne them from the first. Likewise also I venerate and honour and salute the relics of the Saints as of those who fought for Christ and who have received grace from him for the healing of diseases and the curing of sicknesses and the casting out of devils, as the Christian Church has received from the holy Apostles and Fathers even down to us today. John, the most reverend bishop and legate of the Eastern high priests said: This heresy is the worst of all heresies. Woe to the iconoclasts! It is the worst of heresies, as it subverts the incarnation (οἰκονομίαν) of our Saviour. Part of Pope Hadrian's Letter. If you persevere in that orthodox Faith in which you have begun, and the sacred and venerable images be by your means erected again in those parts, as by the lord, the Emperor Constantine of pious memory, and the blessed Helen, who promulgated the orthodox Faith, and exalted the holy Catholic and Apostolic Roman Church your spiritual mother, and with the other orthodox Emperors venerated it as the head of all Churches, so will your Clemency, that is protected of God, receive the name of another Constantine, and another Helen, through whom at the beginning the holy Catholic and Apostolic Church derived strength, and like whom your own imperial fame is spread abroad by triumphs, so as to be brilliant and deeply fixed in the whole world. But the more, if following the traditions of the orthodox Faith, you embrace the judgment of the Church of blessed Peter, chief of the Apostles, and, as of old your predecessors the holy Emperors acted, so you, too, venerating it with honour, love with all your heart his Vicar, and if your sacred majesty follow by preference their orthodox Faith, according to our holy Roman Church. May the chief of the Apostles himself, to whom the power was given by our Lord God to bind and remit sins in heaven and earth, be often your protector, and trample all barbarous nations under your feet, and everywhere make you conquerors. For let sacred authority lay open the marks of his dignity, and how great veneration ought to be shown to his, the highest See, by all the faithful in the world. For the Lord set him who bears the keys of the kingdom of heaven as chief over all, and by Him is he honoured with this privilege, by which the keys of the kingdom of heaven are entrusted to him. He, therefore, that was preferred with so exalted an honour was thought worthy to confess that Faith on which the Church of Christ is founded. A blessed reward followed that blessed confession, by the preaching of which the holy universal Church was illumined, and from it the other Churches of God have derived the proofs of Faith. For the blessed Peter himself, the chief of the Apostles, who first sat in the Apostolic See, left the chiefship of his Apostolate, and pastoral care, to his successors, who are to sit in his most holy seat for ever. And that power of authority, which he received from the Lord God our Saviour, he too bestowed and delivered by divine command to the Pontiffs, his successors, etc. We greatly wondered that in your imperial commands, directed for the Patriarch of the royal city, Tarasius, we find him there called Universal: but we know not whether this was written through ignorance or schism, or the heresy of the wicked. But henceforth we advise your most merciful and imperial majesty, that he be by no means called Universal in your writings, because it appears to be contrary to the institutions of the holy Canons and the decrees of the traditions of the holy Fathers. For he never could have ranked second, save for the authority of our holy Catholic and Apostolic Church, as is plain to all. Because if he be named Universal, above the holy Roman Church which has a prior rank, which is the head of all the Churches of God, it is certain that he shows himself as a rebel against the holy Councils, and a heretic. For, if he is Universal, he is recognized to have the Primacy even over the Church of our See, which appears ridiculous to all faithful Christians: because in the whole world the chief rank and power was given to the blessed Apostle Peter by the Redeemer of the world himself; and through the same Apostle, whose place we unworthily hold, the holy Catholic and Apostolic Roman Church holds the first rank, and the authority of power, now and for ever, so that if any one, which we believe not, has called him, or assents to his being called Universal, let him know that he is estranged from the orthodox Faith, and a rebel against our holy Catholic and Apostolic Church. Theodore the God-beloved bishop of Catanea, standing in the midst, said: The pious emperor, by his honourable jussio, bid send Leo, the most god-beloved presbyter (who together with myself is a slave of your holiness), with the precious letter of his most sacred majesty; and he who reveres our [sic in Greek, your, in Latin] holiness, being the governor (στρατηγὸς) of my province of Sicily, sent me to Rome with the pious jussio of our orthodox Emperors. And when the most blessed Pope heard it, he said: Since this has come to pass in the days of their reign, God has magnified their pious rule above all former reigns. And this suggestion (ἀναφορὰν) which has been read he sent to our most pious kings together with a letter to your holiness and with his vicars who are here present and presiding. Cosmas, the deacon, notary, and chamberlain (Cubuclesius) said: And another letter was sent by the most holy Pope of Old Rome to Tarasius, our most holy and œcumenical Patriarch. Let it be disposed of as your holy assembly shall direct. Peter and Peter, the most reverend presbyters and representatives of the most holy Pope of Old Rome said: Let the most holy Tarasius, Patriarch of the royal city, say whether he agrees (στοιχεῖ) with the letters of the most holy Pope of Old Rome or not. Leo the most renowned secretary said: The holy and blessed Synod know how at the last session we examined various sayings of the God-forsaken heretics, who had brought charges against the holy and spotless Church of the Christians for the setting up of the holy images. But today we have in our hands the written blasphemy of those calumniators of the Christians, that is to say, the absurd, and easily answered, and self-convicting definition (ὅρον) of the pseudosyllogus, in all respects agreeing with the impious opinion of the God-hated heretics. But not only have we this, but also the artful and most drastic refutation thereof, which the Holy Spirit had supervised. For it was right that this definition should be made a triumph by wise contradictions, and should be torn to pieces with strong refutations. This also we submit so as to know your pleasure with regard to it. John, the deacon and chancellor [of the most holy great Church of Constantinople, in Lat. only] read. I can't believe you guys are using this as an example. This is also called the "blasphemo", and was drawn by people mocking Christians worshiping their "God". So the forum of Orthodox Christians uses art that mocked early Christians as an example to justify iconography. I mean... guys - really? So no icons from the 1st or 2nd century, no writings about venerating icons in the 1st or 2nd century, but all came 3rd or later. But they are a tremendous part of the EO faith, involved in practically every form of EO worship. I disagree, we have a ton from that time. Lot's of writings. Lot's of history. Lot's of artifacts. If I have pet beliefs, why are my beliefs written about in the scriptures, documented from early Christianity, whereas iconography is not. I mean, let's really consider who has a pet belief. It's because at that time the church message was spread. The original apostles most likely already deceased. The 2nd century Christians would have adopted teachings and practices from the apostles themselves, without too many years going by for distortion. Also it's to not always be accused of "sola scriptura", as the scriptures were written by the 2nd century. This is important as "sola scriptura" is a trigger for making it easy to shun somebody's point off. The 2nd century Christians were truly a church, which practiced many things that the EO faith did not. As stated in prior posts, St. Polycarp worshiped on the Sabbath, held the Jewish feasts, all now which are banned via canon. I do this to try to look past many men who have been in charge for a long time. God Bless. Please cite a source for the worship practices of Saint Polycarp. Thank You.